From: Peter T. Suzuki and Reiko Watanabe Reiger (2003), A Japanese Soldier's Ethnography of Molu Island (Tanimbar): Ken Sasaki's Account (1944-1945), Archipel 66: 161-199 (doi: 10.3406/arch.2003.3789). Seven villages of the eight villages in this island are Protestant. It seems that only Kilon is shunned by others since it is the only Muslim village. Their association with other villages does not seem to be congenial. In the past they followed a primitive religion in which they worshiped the sun and the moon as gods (Ubila) like any other village. They said they made commitments to Ubila. But later new religions such as Islam and Christianity were introduced into the island. It seemed that the power of religions influenced and also renewed everything such as food, clothing, housing, ceremonial occasions, and language. It is clear Christianity came to this island 35 years ago. Even though the power of Islam could not change the lifestyle of the villagers much, Christianity rapidly changed people's lifestyles on Molu, which had not progressed much from a primitive way of living. The daily language of Molu is called Larat, the island just northeast of Tanimbar, but Larat is also the language of Tanimbar, Sera, and Fordata. The languages of Tanimbar are divided into three groups : Sera, Yamdena, and Larat. Of course they speak to us in Malay, but since Malay is a second language which was taught at school, it is hard to understand much of high Malay. High Malay is only used seriously by guru, who are priests and teachers in a village during the celebration of subayan. Sago grows wild, and belongs to the palm tree group; it grows in flocks in damp ground. Mature trees about 20 years old are cut and smashed at the trunk with axes (111. 6), then washed with water, and soaked till the starch is precipitated. This fruit is also prepared in various ways, such as gruel (babeda), like rice (nasi), deep fried goren [Mal. goreng], toasted rice cake, and renpen which is baked (or cooked) in a stone mold. Sago can be substituted for flour. Renpen looks like a Japanese snack ; foxtail millet toasted until crispy. When it is still hot, it is plump and tasty. They steam the stored renpen, until it becomes soft and like konyaku, a Japanese food made of yam which is gelatenous. Little food is stored in the village. Because they have different crops, harvest time spans the whole year. As long as they gather the food, they do not have to face starvation. Since they do not have to transfer food (sago) from one place to another, they do not trade and they do not store food. But since sago has a short life, its starch must be gathered right away and the juice (toman) from sago is eaten soon, otherwise it is prepared as renpen for a portable meal. Matches are known by the Moluans, but they are rare and considered valuable. Tobacco is lit by flint, rock, and metal much in the same way as in ancient Japan. Split dry bamboo into two and put on the ground or straw surface side up. Make a small crack on the center of the bamboo then shave some surface off from around the crack. Rub with a bamboo spatula at right angles with the bamboo for about 15 minutes till the bamboo starts to smoke and starts on fire. Probably the only wild animal on Molu is the wild pig (babi). The garden plots on Molu are surrounded by a four foot-high fence made of logs and is designed to prevent wild pig incursions. Since most villagers are Christian, they hunt and are fond of eating the meat of the wild pig. Among the islanders one of the most popular goods is tobacco (roko) [Mal. rokok], then chewing sirih comes next. Sirih is a tree leaf, which is similar to a pepper tree. Next in popularity is alcohol (sobi). There is a tree, which is called karupatebu, which is similar to a hemp palm tree and a palm tree. This sugar palm tree is grown mainly for gathering sugar, but a wine can be brewed from it, too ... By the way, comparing coconut milk to sugar palm tree milk, the latter has a rich white color and thickness like milk, and a greater sweet-sour taste. Nothing can beat its taste, not even the best versions of kalpis, and it has a pleasant intoxicating effect. However, the great taste of this version of kalpis enticed me to drink ten glasses of the tempting drink, and helped me to end up sleeping the night in the jungle. During the ridiculous war, I secretly kept this wine in a water bottle for the contingency of a suicide attack, and I often gave myself encouragement by sipping it. Her attention span is getting longer and longer. She can concentrate for 10 or 15 minutes on taking things apart and putting them back together, on putting all 10 or 20 shapes through the matching holes in one of her puzzle toys, on reading books with one or the other of us. She can spend even longer listening to her tapes of children's songs, although sometimes she spends more time pushing the play and stop buttons than listening to her songs. She is especially fond of the Finger Band song, during which she imitates the clarinet, piano, and trombone motions; the Buzzing Bees song, during which she imitates the buzzing sound by blowing a 'raspberry' (or 'Bronx cheer'); the Teddy Bear song, during which she holds her big teddy bear up by the ears and dances back and forth; and, of course, Twinkle, Twinkle, Little Star, during which she 'twinkles' her hands. The first consonants she tackled were [t] and [d]. She has them under relatively good control now and has definitely mastered [dadi] (the word as well as the person). Next, she began to work on words starting with [p] and [b]. Sometime last month, she suddenly realized that her counting word [tuti] had two components and started saying just [tu]. It wasn't long before she was counting [tu] for one step and [ti] for the next. Then one day she counted out [pai] as well. Now she can repeat [tu], [ti], [po], [pai], but she hasn't mastered the meaning of any except [tu]. Another [p]/[b] word she has added recently is [bow] 'go' (versus [taa] or [paa] 'stop'). The [oh] vowel is also new, and she stretches it—and her lips—to great lengths pronouncing it. Another lip sound she has added is [w]. Her first [w] word was a strangely produced [weyl]. Her tongue tip shot all the way out of her mouth during the [l] (ell) part of it. It used to be one of her babbling sounds, but we attached it to the picture of a 'whale' in one of her books, and she has since used it to label 'wheels', 'nails', and 'mail'. The other new vowel is [eh], which appears in [wey] 'away', another favorite word. It also appears in [tu-tu tey] 'choo-choo train'. She seems to make no attempt to repeat a word unless it contains sounds close to those she is working on at any particular moment. Labels: family, Hawai'i, language, U.S. Her passive language ability still far exceeds her active speaking ability, but she has added a few words to her repertoire. During our Christmas trip, she attached the meaning 'all gone, all done, finished' to a high-pitched [datii], with a high-pitch first vowel and a mid-pitch, long second vowel, accompanied by appropriate upturned empty hands. This contrasts with her lower-pitched (mid + low) and shorter [dati], meaning 'thank you.' (She doesn't seem to distinguish [t] and [d].) Finally, there is a low-plus-high-pitched [dati] that she uses to call whichever one of us she can't find. There is also a [daa], with long rising-falling tone, which seems to mean something like 'wow, look at that'; and a steady high-tone [daa], meaning 'stop' or 'stoplight'. The former contrasts somehow with [iyati], meaning roughly 'voici, voilà here it is, there it is'. She has recently added another word: [daau(b)], meaning '(fallen or dropped) down' (or 'dirty, no longer edible' in the case of food). She also seems to be in the process of extending the meaning of [dudu] to cover any fundamental contribution to the ecology of her diaper. She must be about ready to start toilet-training. sonant sounds like both a [b] (or [p]) and a [d] (or [t]) except when it precedes the open vowel /a/. She seems to leave her lips closed before a closed vowel like /i/ or /u/ and to let the air through them only after she releases the /d/ to let the vowel sound come out. Besides [dudu], the other case where this is very noticeable is in her word for counting: [du]-[di] ('two-three'?). Action: Taps on mommy's wrist until mommy acknowledges. Mommy says, "Mommy's watch," meaning "Yes, I am." Meaning: "I seem to be missing mine." Mommy says, "Where's your watch?" Action: She either points in the direction of her watch or goes off to find it. Her biggest accomplishments are social. She walks up to the babysitter's door and knocks on it herself. She waves bye-bye to one or the other of us leaving or staying without her and doesn't get upset. She knows not only our daily cycle, but also has a good feel for our weekly cycle of routines. She warms up to friends and strangers much more quickly than before and plays with other kids, not just near them. She gets very jealous, though, when another kid plays with her toys or her parents. She loves to get rowdy and runs back and forth shrieking and carrying on when the babysitter's kids are being rambunctious. She's at the perfect age to pay a visit to her little cousins. She is at a wonderfully cooperative age now. She enjoys helping us clear the table and take things to the kitchen or pick up things and put them away. It's too good to last. If she senses it's time to go out, she always grabs her lunch basket. If we buy a package of something at the store, she insists on carrying it, or at least trying to. She is also very communicative, but still not very verbal. When she wants something out of the refrigerator, she runs over and yanks the towel off the door handle, then tugs at the door looking over her shoulder and calling our attention. When she wants her vitamins, she points to the bottle on top of the refrigerator and calls our attention. She will stand up on the bed after a diaper change and grab Daddy's hands to play round after round of London Bridge Is Falling Down. If she wants music, she will go up to the table the tape player sits on and rock back and forth several times, then point to the tape recorder and call our attention. When she wants to nurse, she goes up to Mommy and lifts her shirt. times so that we don't get her all keyed up to do something we're not ready to do immediately—like eat or go out for a walk. She gets confused by some near-rhymes, like hedge and head, tongue and thumb, knees and sneeze. She is most fond of d, t, j, and associated consonants, together with i, a, and u for vowels. So far, she hasn't pointed and labelled things for herself, only elicited labels from us or pointed at things we label. Her first "parroted" word was the sound of an owl she picked up from reading an animal book with the babysitter's daughter. Now when the mood strikes her, she runs to a picture-map of the zoo and points to the owl, saying "Hu! Hu!" But of course she's never attempted owl. The only real words she has tried to imitate are Jeep, juice, zoo, and one attempt at boo that came out pretty close to zoo. Of course, adults don't usually sit around naming things at each other. There are other more appropriate social rituals that involve language. She is starting to master some of them. After months of observing us waving bye-bye to each other every morning for her benefit, she has finally figured out what it means and now waves bye-bye to parting friends and vehicles, to bushes whose flowers she has stopped and patted, and to the automatic money machine whose buttons she often stops to play with on the way to the babysitter. She has just begun to say "Hi" appropriately every once in a while, but never on demand. She recognizes yes/no questions addressed to her and often responds with a vigorous shake of the head. At other times, she responds to every question, statement, or command with "huh?" The volcanic island of Ternate, where Wallace first stepped ashore in January 1858, was at that time nominally ruled by an eccentric one-eyed Sultan. An octogenarian, he liked to be addressed by his full title of Tadjoel Moelki Amiroedin Iskandar Kaulaini Sjah Peotra Mohamad Djin. He was the twenty-third Sultan, and traced his authority back to the ruler of Ternate who had been on the throne when the English adventurer Francis Drake came there in 1579 looking for the fabled Spice Islands. Drake had found what he was seeking, because Ternate and the small islands to the south were then the main source of cloves, a spice which cost more than its weight in gold when brought to Europe. The Sultan of Ternate – with his equally autocratic neighbour the Sultan of Tidore, who ruled another little volcano island a mile away – controlled virtually the entire world's supply of the spice, and a good proportion of the nutmeg and mace as well, because these spices happened to grow in domains which paid them tribute. In fact the suzerainty of Ternate and Tidore extended, in theory at least, as far as Waigeo, where nearly three centuries later Wallace found the natives still obliged to send a tribute of feathers from Birds of Paradise to decorate the turbans of the Sultans and their clusters of courtiers. In Drake's day the Sultan of Ternate had been a splendidly barbaric figure, wearing a cloth-of-gold skirt, thick gold rings braided into his hair, a heavy gold chain around his neck, and his fingers adorned with a glittering array of diamonds, rubies and emeralds. By the time Wallace arrived, the effective power of the Sultan had been eroded by more than two centuries of bullying by larger nations who coveted the spice trade. In the mid-nineteenth century Sultan Mohamad Djin was frail and very forgetful, living on a Dutch pension as a doddering semi-recluse who spent his days in his shabby and dusty palace surrounded by his wives, a brood of 125 children and grandchildren, the princes of the blood and their families, courtiers, servants and slaves. Most of them were poverty-stricken. A memory of the glamour remained, however. The Sultan himself would emerge from his palace, the kedaton, for state occasions or to call on the Dutch authorities in the town. These appearances were like mannequins come to life from a museum, and greatly enjoyed by the Sultan's citizens who continued to ascribe semi-divine powers to their overlord. The Sultan and his court would sally forth dressed in a magpie collection of costumes which had been acquired piecemeal from earlier colonial contacts, or had been copied and recopied over the intervening centuries by local tailors. They donned Portuguese doublets of velvet, Spanish silk jackets, embroidered waistcoats and blouses, parti-coloured leggings and Dutch broadcloth coats. Their exotic headgear and weapons ranged from Spanish morions and halberds to swashbuckling velvet hats with drooping plumes and antique rapiers set with jewels. The pièce de résistance was the state carriage, which had been given to an earlier Sultan by the Dutch and was a period piece. It was so badly in need of repair that, to climb aboard it, the elderly Sultan had to mount a portable ladder. Safely ensconced, he was then pulled forward in his rickety conveyance by 16 palace servants harnessed instead of horses, who towed him slowly along to the Dutch Residency a few hundred metres distant. The real power in Ternate when Wallace arrived was not even the Dutch Resident but the chief merchant, Mr Duivenboden. He was of Dutch family but born in Ternate, and had been educated in England. Locally known as the 'King of Ternate', he was extremely rich, owned half the town as well as more than 100 slaves, and operated a large fleet of trading ships. His authority with the Sultan and the local rajahs was considerable, and he was very good to Wallace who, with his help, was able to rent a run-down house on the outskirts of the town and fix it up well enough to serve as his base of operations. He kept this house for three years, returning there regularly from his excursions to the outer islands. Back in his Ternate house, he would prepare and pack his specimens for shipment to Europe, write letters to his family and to friends like Bates, and begin preparations for the next sortie into the lesser-known fringes of the Moluccas. The small villages of the Moluccas have a habit of relocating suddenly. The villagers – usually no more than a dozen families – frequently change the location of their houses which need only a couple of days to erect on a new site. They may move to find better fishing, to a safer anchorage and – above all – to an easier source of fresh water. It was well into the afternoon when the last of the large bays opened up. Ahead of us the afternoon thunderstorms were rolling across the forested ridges and slopes of Waigeo. Surges of grey-black cloud flowed across the tree canopy on a broad front. The wind came ahead, whipping the tops off the wavelets in the bay. Lightning flickered in the depths of the cloud, and then the curtain of grey rain blotted out everything. When the rain cleared we had a glimpse of a tiny white dot in the murk at the back of the bay. It might have been a landmark erected for navigators, but there are no such marks in Waigeo. We set course for it, and crossing the broad bay we found the spire of a tiny, white painted church. In front were a dozen or so palm-thatch houses set on stilts on the water's edge. The jungle came down the hillside to within yards of this tiny village, which looked as if it was about to be swallowed in the vegetation. We anchored and, minutes later, there was the usual response when four canoes put out from the village to visit us. But these were canoes like nothing we had ever seen before. The central hull was a very narrow dugout log, tapering to a fine bow. From each side sprang delicate outriggers that would have done credit to a modern high technology aircraft. They curved out in a beautiful downward line so that the floats barely kissed the water. There was not a nail nor ounce of metal in the entire construction. The sweeping outriggers had been carved from naturally curved wood, and were bound in place with neat strips of jungle rattan. They were so well made and exquisitely balanced that they flexed like the wings of birds, and the entire canoe floated high and light as it skimmed forward. The men in the canoes were pure Papuan with not a trace of Malay in their features. They had tightly curled wiry hair, broad nostrils, deep-set eyes, and very dark skins. In the lead canoe the grey-haired headman of the village was obvious from the deference paid to him by the other men. The canoes clustered around the stern of our prahu, and half a dozen men scrambled on deck. Budi and Julia made introductions and explained why we had come there. The villagers were intrigued to know about their unexpected visitors because the last time they had seen a foreigner was seven years earlier when a butterfly hunter had come to their village. You can hardly sit down and read in her vicinity without her bringing one of her books over for you to read with her. She loves her books and can obviously match pictures in the book to analogous pictures in other contexts, or to real life. She is making good headway now with language. She isn't saying much that resembles English words, but she has gotten a lot more consonants and vowels under control and she strings together several groups of authentic-sounding syllables into play words. She does a lot of singing and babbling to herself, especially when we are out for a walk in the evenings or driving somewhere. She may just on the verge of trying to parrot words we say to her, but she has already mastered the concept of labeling. She loves to extract labels from us for the things she points to. The relationship between fixed labels and the varied items those labels refer to is very clear to her. Her favorite game is to point to one thing for us to label, then point to another, then move her head and finger back and forth too fast for us to keep repeating the two labels in succession. Labels: education, family, language, U.S.
Three social encounters that happened at about the some time showed us very clearly how uncomfortable she is with a lot of fussing and close attention by people she doesn't know very well. First, we took her in to the Deloitte office (where her dad used to work). There are a bunch of friendly women there who love to poke, hold, tickle, and tease babies. She froze until we walked away from the crowd, where she could run about well out of reach of any eager arms. At about the same time, we took her in for her first picture-taking experience. It was very nearly a disaster what with all the close attention the photographer and her assistant was giving her. But the same weekend, I had letters to drop off with some Yapese teachers who were in Waikiki on their way home. I walked into their hotel room with her and then put her down on the floor. Soon she was squatting near one of them, watching as he repacked his suitcase. Later, she was playing between the chairs where two other men were sitting, just as content as could be. The difference here was that these folks weren't paying any attention to her. Music and dance continue to be an important to her. Sometimes music is the only thing that will calm or distract her. We have a variety of cassettes, but I guess she really hasn't heard much hard rock or country western. On the day she was crying so much we used them all. She recognized the Dave Brubeck tape as one that Daddy has danced to with her; she had been sitting in my lap, but as soon as that tape came on, she reached out for him. She has begun to follow our fingers when we point, and she uses her own index fingers to point, too. Outside she points out all the buses; we ride them twice a day now to her babysitter's place, so they are really important to her. At home, she points to things she wants or things she wants us to name or talk about. Her passive vocabulary is growing rapidly. Every day she recognizes more and more things by name, and it now seems to take very few instances of repetition before she "has it." Her spoken vocabulary seems to be shrinking, but she makes the few syllables she's using go far, and she has begun to add final consonants to some of them. Labels: family, Hawai'i, language, music, U.S.
She enjoys music very much, knows that it comes from the cassette player (home) or the stereo (Grandpa's house), claps hands, "dances" (by rocking back and forth), or bangs on the table when the music starts. She often sits down to look at books while music is playing. She has begun to recognize familiar questions and phrases, for example: Where is Daddy/the puppy/the teddy bear book/the jingle bell block/the ball/your toe? Drink water. How big are you? Stretch. Let's go out. Just this morning she is trying out a whole bunch of new sounds, some approaching /d/ and /y/. Also real throat-clearing to go along with the cough that has been part of her "vocabulary" for several months. As her dad says, her speech is not instrumental yet; it is an end in itself. She is definitely having fun with it. During the five months he spent on the islands, Wallace witnessed an extraordinary transformation overtake Dobbo. Throughout January there was a steady arrival of boats and traders, 15 big prahus from Macassar and up to 100 smaller boats from Kei, the New Guinea coast and outer Aru. They clustered into the anchorage or were pulled up on the beach to be scrubbed and have new coats of anti-fouling, while their crews moved into the bamboo houses. The settlement buzzed with activity, and Wallace marvelled – as he had already done at the well-mannered behaviour of his prahu crew that this ill-assorted mass of people managed to get on so well without any formal rule of law, courts or police to keep order. Dobbo was full to bursting with a 'motley, ignorant, thievish population' of Chinese, Bugis, half-caste Javanese, men from Seram, with a sprinkling of half-wild Papuans from Timor and the islands to the south. Yet 'they do not cut each other's throats, do not plunder each other day and night, do not fall into the anarchy such a state of things might be supposed to lead to. It is very extraordinary.' It made him wonder that perhaps European countries were over-governed, and that 'the thousands of lawyers and barristers whose whole lives are spent in telling us what the hundred acts of Parliament mean' indicated that 'if Dobbo has too little law, England has too much'. The reason for the orderliness and good behaviour in Dobbo, he decided, was that every person there had come to trade, and that a peaceful environment for the marketplace was in everyone's interest. So the little sandspit was an amicable parade of regional types and costumes. Chinamen soberly walked down the single street, with their long pigtails hanging down to their heels. Half-naked Aru islanders wearing nothing but a loin-cloth and with enormous bushes of frizzy hair held in place by gigantic wooden combs – called at every door to offer tradable items and see who would pay the best price. Young sailors from Macassar played a kind of aerial football with a hollow ball made of rattan which they kept in the air with a succession of kicks and knocks from feet, elbow and shoulder. The spread of Christianity and Islam was the greatest change to island life since [Alfred Russel] Wallace had been there. When Wallace had come to Kei, the islanders were pagans, with perhaps a few Muslims near the coast where they had met the Sulawesi traders. A century later, every village in the archipelago had become either Muslim or Christian, or both. Warbal was overwhelmingly Christian, with a small Muslim group living round a very discreet mosque near the main landing beach, and Christianity had altered Warbal's village life even more than nationalism. The community was intensely and actively religious. A large church occupied the centre of the village, with 'Immanuel' spelt out in dark purple letters over its front entrance. Foundations were already dug and a first few pillars in place for a second, even more ambitious church on the outskirts. This new church would be huge. From the ground plan it seemed that it would accommodate at least twice the total congregation of Warbal, and the cost of the project must have been prodigious. Although Warbal's Christians had pledged to give free labour, thousands of sacks of cement would have to be imported at huge cost to the community. Meanwhile the old church was thriving. It reverberated to prayer meetings and hymn singing; there were matins and evensongs, Sunday-school sessions and special thanksgiving services. And when the Warbal islanders did not go to church to pray, they met in one another's homes; small groups of men and women could be seen entering one of the little houses, prayer books in hand, at almost any time of day. Visitors to Warbal, if they were foreigners, were expected to be guests of Frans and Mima, who possessed the only house with an aluminium corrugated roof and had a spare room. Frans was a relic of the Dutch colonial days soon after the Pacific war with Japan. Just old enough to have been recruited for the Dutch colonial army, like thousands of other Moluccans he had gone to live in Holland when the Dutch withdrew from Indonesia, evacuating their supporters with them. For 30 years Frans had lived in Holland, working in a Phillips factory, before finally coming back home to retire in Warbal. In Holland he had divorced his first wife and married Mima, who also came from Kei and was perhaps 20 years younger than her husband. They had one young son, Tommy, who was extremely spoiled and went to the Warbal primary school. Their other children were older, and had to live in Tual to continue with their education because there was no secondary school on the island. Frans – short, friendly and losing both his hair and his memory – was the wealthiest man on the island, and a little lonely. The other islanders referred to him as the Belanda, the Hollander, and regarded him as being half-foreign and out of touch. Yet Frans' monthly pension from Holland meant that he owned the newest and largest Johnson [outboard motor], and he could live out his retirement very comfortably in the sunshine, employing a maid and sending men out in his motorised dugout to catch fresh fish for his table. Mima, despite her frequent laugh and constant chatter, hankered after a more modern life in Holland. She admitted that, for all its warm climate and easy lifestyle, Warbal was a dull place to be a housewife after living in the suburbs of Amsterdam. The Turks' attitude to religion came as a pleasant relief to many Orthodox Christians. Held captive by the Ottomans in 1355, the distinguished archbishop of Salonica, Gregory Palamas, was surprised to find the Orthodox Church recognized and even flourishing in the lands under the emir. Prominent Turks were eager to discuss the relationship of the two faiths with him and the emir organized a debate between him and Christian converts to Islam. "We believe in your prophet, why don't you believe in ours?" Muslims asked him more than once. Palamas himself observed an imam conducting a funeral and later took the opportunity to joust over theology with him. When the discussion threatened to overheat, Palamas calmed it down by saying politely: "Had we been able to agree in debate we might as well have been of one faith." To which he received the revealing reply. "There will be a time when we shall all agree." As Byzantine power waned, more and more Orthodox Christians felt caught between two masters. Faced with an apparent choice between the reviled Catholics (their sack of Constantinople in 1204 never to be forgotten) and the Muslim Turks, many opted for the latter. Written off as an embarrassment by later Greek commentators, the pro-Turkish current in late Byzantine politics was in fact a powerful one for the Ottomans, who could be seen as protectors of Orthodoxy against the Catholics. The hope for political stability, the desire for wealth and status in a meritocratic and open ruling system, admiration for the governing capacities of the Ottomans, and their evident willingness to make use of Christians as well as Muslims explain why administrators, nobles, peasants and monks felt the allure of the sultans and why many senior Byzantine noble families entered their service. Murad II's grand viziers were well known for their pro-Christian sympathies; Murad himself was influenced by dervish orders which preached a similarly open-minded stance, and the family sheykh of the Evrenos family was reputed to be a protector of Christians. In the circumstances, it is not surprising why surrender seemed far more sensible an option than futile resistance against overwhelming odds, and why the inhabitants of Salonica themselves were known, according to at least one Byzantine chronicler, as "friends of the Sultan." In the second half of the fourteenth century, one Balkan town after another yielded to the fast-moving Ottoman armies; the Via Egnatia fell into their hands, and even the canny monks of Mount Athos submitted. Salonica itself was blockaded for the first time in 1383, and in April 1387, surrendered without a fight. On this occasion, all that happened was that a small Turkish garrison manned the Acropolis. The town's ruler Manuel Palaeologue had wanted to resist, but he was shouted down by the inhabitants, and forced to leave the city so that they could hand themselves over. Manuel himself paid homage to the emir Murad, and even fought for his new sovereign before being crowned emperor. Had the city remained uninterruptedly under Ottoman control from this point on, its subsequent history would have been very different, and the continuity with Byzantine life not so decisively broken. Having given in peacefully, Salonica was not greatly altered by the change of regime, its municipal privileges were respected by the new rulers and its wealthy monastic foundations weathered the storm. The small Turkish garrison converted a church into a mosque for their own use, and the devshirme child levy was imposed—at intervals Turkish soldiers carried off Christian children to be brought up as Muslims—which must have caused distress. But returning in 1393, Archbishop Isidores described the situation as better than he had anticipated, while the Russian monk Ignatius of Smolensk who visited in 1401 was still amazed by its "wondrous" monasteries. Is anyone else as annoyed as I am by Flickr's cutesy attempts to improve international understanding (or whatever) by telling you how to say some equivalent of Hello in a randomly chosen language whenever you refresh your Flickr homepage? The one that set me off most recently is Korean Bangawoyo 'Pleased (to meet you)', which corresponds in usage to Japanese Hajimemashite, French Enchanté, or Romanian Îmi pare bine (or Frenchified Încântat), and so on. None of those equivalents are on Flickr's list of greetings. For Korean, I would have expected something like Annyeong (안녕), which is a good match for Arabic Salaam or Hebrew Shalom. Do Flickr's intrepid researchers just ask random speakers of random languages for greetings and then accept whatever they're told? Have they never heard of Omniglot? Can someone tell me what Mingalaba really means in Burmese? 'Come eat!' perhaps? One could occasionally hear schoolboys in rural Japan (when I was a kid in the 1950s) greet the rare European-looking foreigner with the first English phrase they had had to memorize in school, "This is a pen!" A former Peace Corps volunteer in Korea told me that the equivalent greeting there was "You are a monkey!" Both would be refreshing additions to Flickr's randomly generated greetings. UPDATE: Of course, "Haro! Haro!" was by far the most common greeting directed at Westerners when I was a kid, but was somewhat less common when the Outliers visited in 1985, and much, much rarer during our sabbaticals there in 2005-2006, even when we were pretty far off the usual foreigner circuits. Being greeted as if I were a talking parrot used to irritate me a lot as a kid, as did constantly being stared at, or having my skin or hair stroked or cheeks pinched by little old ladies when I was a child. When a bunch of junior high school boys tried out their "Haro!" on me in the gardens of Ginkaku-ji (the Silver Pavilion) in 1985, I responded in Japanese with "Haroharo tte ningen no kotoba desu ka?" ('Is "haroharo" a human word?'). That seemed to silence them for a few moments. WHEN THE ENGLISH expelled their Jews in 1290, they inaugurated a policy which spread widely over the next two centuries. In 1492 Ferdinand and Isabella's edict of banishment forced thousands from a homeland where they had known great security and prosperity. Sicily and Sardinia, Navarre, Provence and Naples followed suit. By the mid-sixteenth century, Jews had been evicted from much of western Europe. A few existed on sufferance, while many others converted or went underground as Marranos and New Christians, preserving their customs behind a Catholic facade. The centre of gravity of the Jewish world shifted eastwards—to the safe havens of Poland and the Ottoman domains. In Spain itself not everyone favoured the expulsions. (Perhaps this was why a different policy was chosen towards the far more numerous Muslims of Andalucia who were forcibly converted, and only expelled much later.) "Many were of the opinion," wrote the scholar and Inquisitor Jeronimo de Zurita, "that the king was making a mistake to throw out of his realms people who were so industrious and hard-working, and so outstanding in his realms both in number and esteem as well as in dedication to making money." A later generation of Inquisitors feared that the Jews who had been driven out "took with them the substance and wealth of these realms, transferring to our enemies the trade and commerce of which they are the proprietors not only in Europe but throughout the world." The expulsion of the Jews formed part of a bitter struggle for power between Islam and Catholicism. One might almost see this as the contest to reunify the Roman Empire between the two great monotheistic religions that had succeeded it: on the one side, the Spanish Catholic monarchs of the Holy Roman Empire; on the other, the Ottoman sultans, themselves heirs to the Roman Empire of the East, and rulers of the largest and most powerful Muslim empire in the world. Its climax, in the sixteenth century, pitted Charles V, possessor of the imperial throne of Germany and ruler of the Netherlands, the Austrian lands, the Spanish monarchy and its possessions in Sicily and Naples, Mexico and Peru, against Suleyman the Magnificent, who held undisputed sway from Hungary to Yemen, from Algiers to Baghdad. Ottoman forces had swept north to the gates of Vienna and conquered the Arab lands while Ottoman navies clashed with the Holy League in the Mediterranean and captured Rhodes, Cyprus and Tunis, wintered in Toulon, seized Nice and terrorized the Italian coast. The Habsburgs looked for an ally in Persia; the French and English approached the Porte. It was an early modern world war. [Salonica's Jews] worshipped in synagogues named after the old long-established homelands—Ispanya, Çeçilyan (Sicilian), Magrebi, Lizbon, Talyan (Italian), Otranto, Aragon, Katalan, Pulya, Evora Portukal and many others—which survived until the synagogues themselves perished in the fire of 1917. Their family names—Navarro, Cuenca, Algava—their games, curses and blessings, even their clothes, linked them with their past. They ate Pan d'Espanya (almond sponge cake) on holidays, rodanchas (pumpkin pastries), pastel de kwezo (cheese pie with sesame seed), fijones kon karne (beef and bean stew) and keftikes de poyo (chicken croquettes), and gave visitors dulce de muez verde (green walnut preserve). People munched pasatempo (dried melon seeds), took the vaporiko across the bay, or enjoyed the evening air on the varandado of their home. When Spanish scholars visited the city at the end of the nineteenth century, they were astonished to find a miniature Iberia alive and flourishing under Abdul Hamid. For this, the primary conduit was language.... In Salonica there was a religious variant—Ladino—and a vernacular which was so identified with the Jews that it became known locally as "Jewish" (judezmo), and quickly became the language of secular learning and literature, business, science and medicine. Sacred and scholarly texts were translated into it from Hebrew, Arabic and Latin, because "this language is the most used among us." In the docks, among the fishermen, in the market and the workshops the accents of Aragon, Galicia, Navarre and Castile crowded out Portuguese, Greek, Yiddish, Italian and Provençal. Eventually Castilian triumphed over the rest. "The Jews of Salonica and Constantinople, Alexandria, and Cairo, Venice and other commercial centres, use Spanish in their business. I know Jewish children in Salonica who speak Spanish as well as me if not better," noted Gonsalvo de Illescas. The sailor Diego Galan, a native of Toledo, found that the city's Jews "speak Castilian as fine and well-accented as in the imperial capital." They were proud of their tongue—its flexibility and sweetness, so quick to bring the grandiloquent or bombastic down to earth with a ready diminutive. On 31 August 2008, before the announcement of the 2009 Nobel Prize for Literature, signandsight.com published an excerpt from Herta Müller's latest novel, “Everything I Own I Carry With Me” (“Atemschaukel”). Here's an excerpt from the excerpt that captures the ambiguities of close friendships in police states, at least judging from our own experience in Romania in 1983-84. The three years at the tractor factory Tehnometal where I was a translator are missing [from my Securitate file]. I translated the manuals for machines imported from the GDR, Austria and Switzerland. For two years I sat with four bookkeepers in the office. They worked out the wages of the workers, I turned the pages of my fat technical dictionaries. I didn't understand the first thing about hydraulic or non-hydraulic presses, levers or gauges. When the dictionary offered three, four, or even seven terms, I went out onto the factory floor and asked the workers. They told me the correct Romanian word without any knowledge of German – they knew their machines. In the third year a "protocol office" was established. The company director moved me there to work alongside two newly employed translators, one from French, the other from English. One was the wife of a university professor who, even in my student days, was said to be a Securitate informant. The other was the daughter-in-law of the second most senior secret service officer in town. Only those two had the key to the file cupboard. When foreign professionals visited, I had to leave the office. Then, apparently, I was to be put through two recruitment tests with the secret police officer Stana, to be made suitable for the office. After my second refusal, his goodbye was: "You'll be sorry, we'll drown you in the river." IN THE 1930s, the spirit of the Sufi holy man Mousa Baba was occasionally seen wandering near his tomb in the upper town. Even today house-owners sometimes dream that beneath their cellars lie Turkish janissaries and Byzantine necropoles. One reads stories of hidden Roman catacombs, doomed love-affairs and the unquiet souls who haunt the decaying villas near the sea. One hears rumours of buried Jewish treasure guarded by spirits which have outwitted the exorcists and proved themselves too strong for Mossad agents, former Nazis and anyone else who has tried to locate the hidden jewels and gold they protect. But Salonica's ghosts emerge in other ways too, through documents and archives, the letters of Byzantine archbishops, the court records of Ottoman magistrates and the hagiographies of the lives and extraordinary deaths of Christian martyrs. The silencing of the city's multifarious past has not been for lack of sources. Sixteenth-century rabbis adjudicate on long-forgotten marital rows, business wrangles and the tribulations of a noisy, malodorous crowded town. The diary of a Ukrainian political exile depicts unruly Jewish servants drunk in the mud, gluttonous clerics, a whirl of social engagements, riots and plague. Travellers—drawn in ever-increasing numbers by the city's antiquities, by the partridge and rabbits in the plains outside, by business, art or sheer love of adventure—penned their impressions of a magical landscape of minarets, cypresses and whitewashed walls climbing high above the Aegean. From the late nineteenth century—though no earlier—there are newspapers, more and more of them, in half a dozen languages, and even that rarity in the Ottoman lands—maps. As for the archives, they are endless—Ottoman, Venetian, Greek, Austrian, French, English, American—compiled conscientiously by generations of long-departed foreign consuls. Drawing on such materials, I begin with the city's conquest by Sultan Murad II in 1430, delineate its daily life under his successors, and trace its passage from the multiconfessional, extraordinarily polyglot Ottoman world—as late as the First World War, Salonican boot-blacks commanded a working knowledge of six or seven languages—to its role as an ethnically and linguistically homogenised bastion of the twentieth-century nation-state in which by 1950, more than ninety-five per cent of the inhabitants were, by any definition, Greek. The old empires collapsed and nations fought their way into being, identities changed and people were labelled in new ways: Muslims turned into Turks, Christians into Greeks. Although in Salonica it was the Greeks who eventually got their state, and Bulgarians, Muslims and Jews who in different ways lost out, it is worth remembering that elsewhere Greeks too lost out—in Istanbul, for example, or Trabzon, Alexandria and Izmir, where thousands died during the expulsions of 1922. Cities, after all, are places of both eviction and sanctuary, and many of the Greek refugees who made a new home for themselves in Salonica had been forced from their old ones elsewhere. Similar transformations occurred in cities across a wide swathe of the globe—in Lviv, for instance, Wroslaw, Vilna and Tiflis, Jerusalem, Jaffa and Lahore. Each of these endured its own moments of trauma caused by the intense violence that has accompanied the emergence of nation-states. Was the function of the Israeli Custodian of Absentee Property after 1948, for example, handing out Arab properties to new Jewish owners, very different from that of the Greek Service for the Disposal of Jewish Property founded in Salonica five years earlier? Both systematized the violence of dispossession and sought to give it a more lasting bureaucratic form. Thanks to their activities, the remnants of former cities may also be traced through the trajectories of the refugees who left them. A retiree clipping her roses in a Sussex country garden an elderly merchant in an Istanbul suburb and an Auschwitz survivor in Indianapolis are among those who helped me by reviving their memories of a city that is long gone. By 1950, when this book concludes, Salonica's Muslims had been resettled in Turkey, and the Jews had been deported by the Germans and most of them killed. The Greek civil war had just ended in the triumph of the anti-communist Right, and the city was set for the rapid and entirely unexpected pell-mell postwar expansion which saw its population double and treble within thirty or forty years. A forest of densely packed apartment blocks and giant advertising billboards sprouted where in living memory there had been cypresses and minarets, stables, owls and storks. Its transformation continues, and today Russian computer whiz-kids, Ghanaian doctors, Albanian stonemasons, Georgian labourers, Ukrainian nannies and Chinese street pedlars are entering Salonica's bloodstream. Many of them quickly learn to speak fluent Greek, for the city's position within the modem nation-state is unquestioned: the story of its passage from Ottoman to Greek hands has become ancient history. The other change in human relations in Fiji has been an amelioration within the maritime sector of the sensitive issue of race relations. The exclusion of all but indigenous Fijians from the Waterside Workers and Seamen's Union, which was registered in 1946 with a specific racial limitation clause, continued until a rival unsegregated seamen's union emerged in 1992. The reasons for the initial segregation are deeply embedded in colonial history. However, with the increase of Fijians as wage earners in ports and shipping, trade union exclusiveness seemed as much a matter of class as race. Ports and shipping had Fijian laborers and ratings, while Europeans and part-Europeans were officials and officers. Capital in turn came from the United Kingdom and Australasia and locally from Indo-Fijian commercial sources. The more class-conscious union organizers saw the Fijians as "workers" and the others as "bosses" who were not eligible for union membership. Kiribati in 1959 (as part of the Gilbert and Ellice Islands crown colony, GEIC) was already supplying seafarers to the China Navigation Company of Britain. There were also crews and a few I-Kiribati nationals serving as officers, usually with European captains, on colony ships sailing on long-distance interisland routes. In terms of distance, Kiribati shipping was virtually foreign-going.... Kiribati is now the principal country in the Pacific island region for supplying seafarers. This is a scan from a faded old photocopy of a cartoon ad by Bob Browne for New Guinea Motors in the Papua New Guinea Post-Courier, 1976. 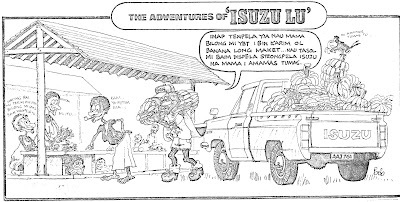 According to the Foreword in Isuzu Lu Book 5, Browne's Isuzu Lu ads paved the way for locally created cartoon strips in PNG newspapers. The Phantom was among the most popular strips in 1976. Lu: Mi raun wantaim sampela ol wantok ... Mipela lusim pinis Papua New Guinea na kamap holide long America ... Man, mi lukim olgeta samting hia na mi airaun nogut tru ... Lukim ka hia ... Oiyo, em i no liklik ... Tasol bensin em i save usim, em i no likliki tu ... Long dispela samting yu no ken winim Isuzu!! 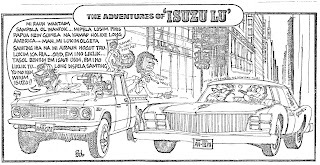 Lou: I'm traveling with some friends ... We have left Papua New Guinea and arrived on holiday in America ... Man, I see all the things here and I'm overwhelmed ... Look at this car ... Wow, it's not little ... but the gasoline it uses, that's no little bit either ... For that you can't beat Isuzu!! Man with cigarette: Hey misis, Yu gat masis? / Hey lady, you got a match? Labels: language, Papua New Guinea, travel, U.S.
Ottoman power also drove important political change in Europe during the sixteenth and seventeenth centuries, contributing to the rise of nation-states and new national identities in two key ways. First, the Ottoman Empire’s presence in European politics allowed leaders from England to the Balkans to use alliances with Istanbul to counter the policies of larger and more powerful Christian European rivals. Second, Muslim mariners attacked European coastal areas and seized more than a million Europeans. These attacks decimated coastal regions, undermined the authority of some governments, redefined national identities, and compelled some governments to extend unprecedented rights and guarantees to their subjects—rights that became cornerstones of the Euro-Atlantic legal tradition today. One saw this two-track process unfold across Europe from the sixteenth century until the mid eighteenth century. While one might question Stephen Fischer-Galati’s contention that the Ottoman threat guaranteed the survival of the Protestant Reformation, there is no doubt that the simultaneous challenges of the Ottoman Empire and of the Protestant Reformation taxed the resources and complicated the strategic calculations of Catholic leaders. On multiple occasions—including periods when Ottoman armies appeared to threaten Europe—Protestant states in Germany refused to contribute soldiers to participate in military operations against the Ottoman armies or discuss funding wars against the Ottomans with Catholic Habsburg officials before all internal religious issues had been resolved. For all of their power and wealth, Catholic leaders—Charles V of Spain and Ferdinand I of Austria—had little choice but to negotiate directly with smaller German states and respect their religious views, no matter how objectionable they appeared to be to Catholic audiences. This was a major blow to states that saw themselves as absolute monarchies beholden to no one except God. Nor were Catholic resources stretched only in Germany. In its many protracted conflicts with the Netherlands, France, and England, Spain always had to allow for the fact of military alliances with the Ottoman Empire, which could strike Spanish possessions far removed from Western Europe. Dutch Calvinists used Ottoman markets to circumvent a Spanish embargo on Dutch trade with Iberia—an embargo meant to punish Holland for seeking independence from the Spanish crown. Thanks in part to Ottoman markets and military assistance, the Dutch won their independence in 1609. Protestant England and Catholic France also used Ottoman power as a vehicle to assert their national identity and interests against Spain’s power in Europe. In one instance, Spain was compelled to release France’s king, Francis I, shortly after Spanish armies seized him and defeated the French army at Pavia in 1525: the Ottoman Empire had signaled its desire for the immediate release of the French king. Subsequently, Francis admitted to a Venetian diplomat that he saw the Ottoman Empire as the only force capable of “guaranteeing the combined existence of the states of Europe” against Spanish power. I found Joseph Nehama's magisterial Histoire des Israélites de Salonique, and began to see what an extraordinary story it had been. The arrival of the Iberian Jews after their expulsion from Spain, Salonica's emergence as a renowned centre of rabbinical learning, the disruption caused by the most famous False Messiah of the seventeenth century, Sabbetai Zevi, and the persistent faith of his followers, who followed him even after his conversion to Islam, formed part of a fascinating and little-known history unparalleled in Europe. Enjoying the favour of the sultans, the Jews, as the Ottoman traveller Eviiya Chelebi noted, called the city "our Salonica"—a place where, in addition to Turkish, Greek and Bulgarian, most of the inhabitants "know the Jewish tongue because day and night they are in contact with, and conduct business with Jews." Yet as I supplemented my knowledge of the Greek metropolis with books and articles on its Jewish past, and tried to reconcile what I knew of the home of Saint Dimitrios—"the Orthodox city"—with the Sefardic "Mother of Israel," it seemed to me that these two histories—the Greek and the Jewish—did not so much complement one another as pass each other by. I had noticed how seldom standard Greek accounts of the city referred to the Jews. An official tome from 1962 which had been published to commemorate the fiftieth anniversary of its capture from the Turks contained almost no mention of them at all; the subject had been regarded as taboo by the politicians masterminding the celebrations. This reticence reflected what the author Elias Petropoulos excoriated as "the ideology of the barbarian neo-Greek bourgeoisie," for whom the city "has always been Greek." But at the same time, most Jewish scholars were just as exclusive as their Greek counterparts: their imagined city was as empty of Christians as the other was of Jews. As for the Muslims, who had ruled Salonica from 1430 to 1912, they were more or less absent from both. Centuries of European antipathy to the Ottomans had left their mark. Their presence on the wrong side of the Dardanelles had for so long been seen as an accident, misfortune or tragedy that in an act of belated historical wishful thinking they had been expunged from the record of European history. Turkish scholars and writers, and professional Ottomanists, had not done much to rectify things. It suited everyone, it seemed, to ignore the fact that there had once existed in this corner of Europe an Ottoman and an Islamic city atop the Greek and Jewish ones. How striking then it is that memoirs often describe the place very differently from such scholarly or official accounts and depict a society of almost kaleidoscopic interaction. Leon Sciaky's evocative Farewell to Salonica,the autobiography of a Jewish boy growing up under Abdul Hamid, begins with the sound of the muezzin's cry at dusk. In Sciaky's city, Albanian householders protected their Bulgarian grocer from the fury of the Ottoman gendarmerie, while well-to-do Muslim parents employed Christian wet-nurses for their children and Greek gardeners for their fruit trees. Outside the Yalman family home the well was used by "the Turks, Greeks, Bulgarians, Jews, Serbs, Vlachs, and Albanians of the neighbourhood." And in Nikos Kokantzis's moving novella Gioconda, a Greek teenage boy falls in love with the Jewish girl next door in the midst of the Nazi occupation; at the moment of deportation, her parents trust his with their most precious belongings. Have scholars, then, simply been blinkered by nationalism and the narrowed sympathies of ethnic politics? If they have the fault is not theirs alone. The basic problem—common to historians and their public alike—has been the attribution of sharply opposing, even contradictory, meanings to the same key events. Both have seen history as a zero-sum game, in which opportunities for some came through the sufferings of others, and one group's loss was another's gain: 1430—when the Byzantine city fell to Sultan Murad II—was a catastrophe for the Christians but a triumph for the Turks. Nearly five centuries later, the Greek-victory in 1912 reversed the equation. The Jews, having settled there at the invitation of the Ottoman sultans, identified their interests with those of the empire, something the Greeks found hard to forgive. It follows that the real challenge is not merely to tell the story of this remarkable place as one of cultural and religious co-existence—in the early twenty-first century such long-forgotten stories are eagerly awaited and sought out—but to see the experiences of Christians, Jews and Muslims within the terms of a single encompassing historical narrative. National histories generally have clearly defined heroes and villains, but what would a history look like where these roles were blurred and confused? Can one shape an account of this city's past which manages to reconcile the continuities in its shape and fabric with the radical discontinuities—the deportations, evictions, forced resettlements and genocide—which it has also experienced? Nearly a century ago, a local historian attempted this: at a rime when Salonica's ultimate fate was uncertain, the city struck him as a "museum of idioms, of disparate cultures and religions." Since then what he called its "hybrid spirit" has been severely battered by two world wars and everything they brought with them. I think it is worth trying again. One of the frequent catch-phrases in Japanese foreign policy discussions these days is 脱米入亜 datsu-Bei nyuu-A 'leave America join Asia', one of many trial balloons floated by the new DPJ-led government. This phrase (r)evokes an older formulation attributed to one of the most avid Westernizers of the Meiji era, Fukuzawa Yukichi, who must hold the world record in Sinographic neologism. (One of the neologisms sometimes attributed to him is minshuushugi [people-master-ism] 'democracy'.) His policy prescription for Japan in the late 19th century was 脱亜入欧 datsu-A nyuu-Ou 'leave Asia join Europe'. How feasible for Japan is 脱米入亜 datsu-Bei nyuu-A 'leave America join Asia'? Kyushu-based blogger Ampontan is translating and hosting a series of columns by Shimojo Masao, one of Japan's top specialists on Korea (whose second language is Korean), who weighs in on the issue. Here is Ampontan's translation of Shimojo's first column, in its entirety. There has been a change of government in Japan for the first time in half a century, and a Democratic Party of Japan administration has taken power under the leadership of Hatoyama Yukio. Among his policy initiatives, the concept of an East Asian entity or community similar to the European Union is receiving widespread attention. The alliance with the United States has been the cornerstone of international relations for Japan since the Liberal Democratic Party came to power. People are discussing whether the change of government might mean Japan has chosen to turn away from the U.S. and place a greater emphasis on Asia. A full understanding of the distinctive historical characteristics of East Asia is required before embarking on such a course, however. While Japan, the Korean Peninsula, and China on the continent are close geographically, the history of their social systems is different. They have less in common than the members of the European Union, which had shared Christian beliefs and intermarriage of the ruling classes. In Japan’s case, a social system that incorporated regional authority was formed after the establishment of the Kamakura Shogunate in the 12th century, and the foundation of a market economy was created. That is why Japan, with a system closely resembling capitalism, was quickly receptive to Western civilization after the Opium War of 1840. In contrast, a system of centralized authority was maintained in China and on the Korean Peninsula despite the arrival of modernization. For many years, they had what amounted to planned economies. The history of Japan vis-à-vis China and the Korean Peninsula is that of relationships similar to the one between the United States and the Soviet Union during the Cold War. The achievement of an East Asian entity depends on whether Prime Minister Hatoyama is possessed of the awareness of those historical differences and the insight to perceive what is necessary to overcome them. Labels: Asia, China, Europe, Japan, Korea, U.S. The June 2009 issue of Journal of World History has an enlightening bit of historical revisionism by Alejandra Irigoin entitled The End of a Silver Era: The Consequences of the Breakdown of the Spanish Peso Standard in China and the United States, 1780s–1850s (Project MUSE subscription required). Here are her conclusions (pp. 238-239). This article argues for revision of traditional views of the global silver trade with China in the late eighteenth and early nineteenth centuries. Section I shows that the existing historiography tends to ignore that silver imports into China continued for longer than normally acknowledged and at increased levels up to the 1820s. New evidence shows that the structure of the silver trade changed substantially when US merchants became central intermediaries between Spanish American silver "producers" and Chinese "consumers," when Chinese imports of silver consisted increasingly of Spanish American coins, the so-called pillar and bust dollars. Section II explores the role of Americans as intermediaries who increased trade with Spanish America in order to obtain silver coins needed to trade with China. The timing of the flow of silver out of China to pay for opium purchases is challenged, as is opium as a cause for the desilverization of China. This article also questions received wisdom that reduction in the supply of silver owing to Spanish American independence was the root cause of silver scarcity in China in the early nineteenth century. This received wisdom ignores a fundamental fact: Spanish America itself was a significant reservoir of silver coins in the world. Thus, (relatively minor) interruptions in the production of silver—at different points in time and in distinct places—in South America during Independence were unlikely to account for supply shortages in China, and continued exports of silver into the United States confirm this view. Hence, the fall in Chinese silver imports must be a function of demand-side forces in addition to supply-side problems. Spanish American independence presented a different problem to the global economy. The Spanish Empire broke up into a multitude of distinct states in the wake of independence, each fiscally and monetarily autonomous. In other words, the largest monetary union of the premodern world had collapsed. The resulting fragmentation of coinage and seigniorage across postindependent Spanish America terminated a silver standard that had organized international trade throughout the early modern world, East and West and in between. New republican governments, especially in regions with silver endowments, took over mint houses in the service of local and regional interests. Coins minted in various mint houses began to diverge in quality and fineness, whereupon the universal standard of the Spanish silver peso was definitively lost. Section IV advances the central argument of this paper, namely that Chinese demand for silver, at least since the late eighteenth century, involved demand for a certified and reliable means of payment, as opposed to silver in some generic sense. "Good" colonial Spanish American coins traded at a premium over the sycee [ingot] equivalent, clearly confirming this point. Fragmentation of the Spanish monetary standard after independence had a devastating influence on Chinese demand. The impact of Spanish American independence on China's economy operated through deterioration of coin quality, not through quantities of silver per se. By contrast, the United States used Spanish dollars as legal tender under the control of central monetary authorities, thereby succeeding in keeping new peso coins in circulation for a decade or more. The end of the silver standard following independence in Spanish America during the 1810s and the 1820s had major consequences for development of the global economy before the gold standard. On one hand, termination of the silver era contributed to the poor economic performance of the Chinese economy. A lack of high-quality, reliable Spanish pesos between the 1820s and the 1850s, rather than insufficient silver mining, largely explains the fall in Chinese silver imports. Hence, I argue that the Chinese silver trade in these decades was demand-side rather than supply-side (mining) driven. Consequences for the internal market in China were manifold, including increased transaction costs, fragmentation of markets, and credit shortages. On the other hand, the United States reacted differently—and with a different timing—to termination of the silver standard. Immediate detrimental effects were weathered by workings of a well-integrated banking system, a quasi–monetary authority, and assay by the mint. Ultimately, this article poses an important comparative question for economic historians: in light of the US response, why did the Chinese empire never monopolize seigniorage, and why did it fail to provide reliable control of its currency system in the face of high costs for the domestic Chinese economy? Answers fall well beyond the scope of this article, of course, but the question should at least be framed in a global context. Labels: China, economics, Latin America, opium, Spain, U.S.